Happy New Year everyone! We hope you all had a great festive break and are back and feeling refreshed. Many families take the holidays to relax and assess their lives with resolutions and big decisions. Maybe you have made the decision to sell your property and move house in 2019 – if that’s the case then we have some tips to help you get the best price for your property in this time of uncertainty. Whether you have been in your current home for a couple of years or a couple of decades, the chances are you have, subconsciously or otherwise, acquired lots of ‘stuff’. Whether it’s magazines, old clothes you just can’t be without, holiday fridge magnets or random ornaments – clean lines sell houses. We’re not saying throw them out just pack them out of sight. Moving house often provides an opportunity to cull any items which you don’t need. You might love that orange and purple décor in your master bedroom, BUT that’s not for everyone. If you are thinking of putting your home on the market now would be a good time to give the place a lick of paint. Neutral colours will help prospective buyers see the potential and visualise how they could put their own stamp on it. You wouldn’t sell a dirty car to someone would you? A clean and tidy home will give the impression that the property has been well-looked after. We’re not talking about making the house smell like bleach, but make sure your windows, work surfaces and walls are all clean. 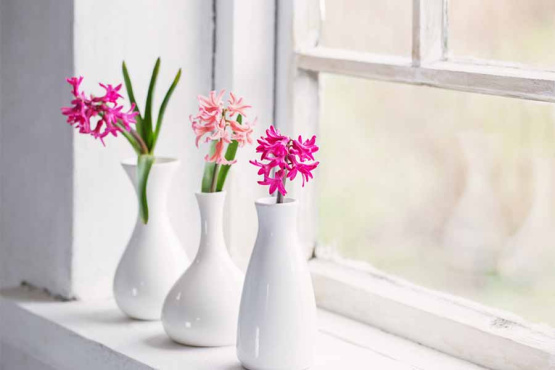 It also doesn’t hurt to add some sort of room scent, whether that is a neat looking diffuser or a hidden plug-in – you could also add fresh flowers to a room for extra decoration. This is all about first impressions. When a prospective buyer arrives at your property what is their first reaction? According to research, buyers make up their minds about a property within the first 30 seconds of seeing it. So, make sure you pay attention to the outside as much as the inside. Clean windows, trim hedges, jet wash driveways and make sure any plants are well kept. We love our furry friends but it’s no secret that they carry with them very specific aromas which are not always conducive to selling a property. As pet owners we are sometimes a little oblivious to the smell that lives in our homes and so, we recommend that you shampoo the carpets and any upholstery which may have animal smells clinging to them. This might be the most important step of all. Make sure that you find the right agent, one who is going to get you good quality potential buyers and keep your best interests at heart when negotiating on your behalf. If you have friends who have recently sold, ask them for a recommendation. Our team are always on hand to answer your questions and we pride ourselves on our unparalleled service levels. We take our role as the leading independent estate agent in Beaconsfield very seriously and strive to maintain and improve our service levels constantly. If you would like to speak to a member of our team about your property options or anything in this article, you can give us a call on 01494 680018 or email us. You can also find properties for sale in Beaconsfield on our website and follow us on Facebook, Twitter, Instagram and LinkedIn for all the latest updates.